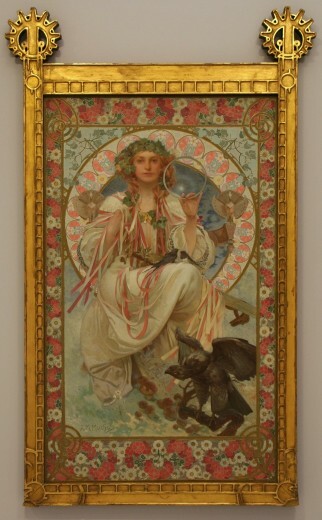 To mark the marriage of his daughter Josephine to Harold C. Bradley, Charles Richard Crane commissioned Mucha to paint a portrait of Josephine as the Slav goddess, Slavia. The portrait was to be incorporated into the interior decoration of a new house that Crane was building for the newlyweds. Ten years later, when Mucha was commissioned to design banknotes for the newly founded Czechoslovakia, he used this portrait as the main motif on the 100 crown note.